In some ways it's strange to think that Northern Irish crime writer Steve Cavanagh's debut THE DEFENSE was only published four years ago. His tales featuring New York City conman-turned-defense lawyer Eddie Flynn have already become one of the best legal thriller series around. For me, Flynn and Cavanagh are the best tandem to hit the courtroom crime scene since Michael Connelly introduced 'Lincoln Lawyer' Mickey Haller more than a decade ago. But don't just take my word for it: the Crime Writers Association awarded THE LIAR, the third book in Cavanagh's series, the prestigious Gold Dagger last year, effectively naming it the best crime novel in the world. At the same time the fourth Eddie Flynn tale, THIRTEEN, was firmly ensconced on bestseller lists for months, and then appeared on numerous 'best of of the year' lists to end 2018. Now, Cavanagh throws readers a curve ball with an exceptional standalone that further demonstrates that the big man from Belfast has elbowed his way onto the top table of crime writing already. 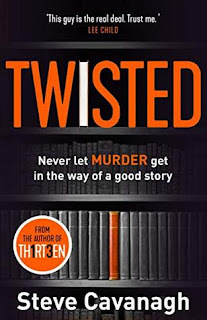 TWISTED is like the crime fiction equivalent of a Penn & Teller show, where Cavanagh lays out some of the tricks of the trade up front and then still dazzles you with his skill and delivery anyway. Readers are forewarned to distrust the narrator and expect some twists, but unlike some other highly publicised 'amazing twist' books out there, that doesn't diminish or distract from the story itself. It starts with a couple who's relationship is shattered after the wife discovers her husband might be JT LeBeau, a famously secretive and incredibly successful author with a dark past. When the wife ends up in a coma and the husband flees, who should the reader believe? We think we know what happened, even if those investigating the crime don't, but can we believe we've been told the truth? And regardless of where the truth may lie, it's a heck of a rollicking read to uncover how it all unfolds. Once again Cavanagh delivers a compelling book that's so much more than it's high-concept hook, both upturning and over-delivering on reader expectations or any marketing hype. TWISTED underlines why the former bouncer from Belfast has rocketed up the crime ranks.